While I have received a KlutchClub Best-Of Box, I never subscribed to the specific monthly boxes.. until now! 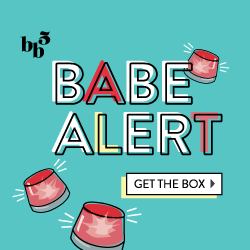 They offer three options which is great: a womens, mens and mom box, so that the products can more specifically relate to their customer. I was always wary due to the price ($18 per month, as shipping is $8 alone) as you never really know what you’re going to get in each box, but I got a deal on PlumDistrict and so it cut my costs in half. I have to admit, I love their boxes! The whole packaging scheme is so clever and no other company has done the same thing. it’s like a drawer, once you open the panel at the end, the box slides out and you can see all the items inside (see below). Are you ready for the details!? I was IMPRESSED with this box, especially due to the variety: some snacks, some bath and body, and other wellness items, as well as the quantity: how many products total and the size of some. First up, we have Nature’s Gate 40th Anniversary Herbal Body Wash. This product is massive! It’s a full-size, 16oz. pump bottle that you can use to create bubbles in your bath or wash your body off with. It’s an interesting mixture of scents and ingredients with sweet almond oil, sage, lavender, shea butter and more, but it’s definitely soothing and relaxing. Okay, so this product is not only clever, but tastes good! I brought this 8.4 oz Seksi Pearl Infused Beauty Beverage in Pomegranate flavor to work the other day to have with lunch/as a snack, and it tastes like a fizzy fruity soda. It claims to be a ‘pearl-infused-beauty’ drink, and upon further looking, I saw that the proprietary blend is simply caffeine and ‘calcium as pearl powder’. I’m guessing the caffeine wakes you up and calcium helps refresh your skin. Next up are the Boulder Canyon Rice & Bean Snack Chips. These gluten-free, all natural chips are fairly low in calories, and even have fiber, protein and vitamins. They’re basically an alternate snack to super-processed tortilla or potato chips, and this package was the perfect size for 1 person. This sample-size/one serving-size package of Crum Creek Delicious & Healthy Mini Breadsticks was just too cute. They’re vegan, kosher and available in a variety of flavors, which I believe mine are ‘Everything.’ They’re nothing extravagantly special and I tend to stray away from too many carby items, but it was a good one-time try. Did anyone ever have Go-Gurt before? If so, this whole new to-go squeezy bottle thing totally reminds me of them. I’ve had yogurts, protein gels, apple sauces and more in these funny little twist off bottles! Well, anyway, these Happy Squeeze Greek Yogurts came in RazzleBerry and Peachy Keen (oddly enough two of my fave greek yogurt flavors) and are full of calcium, and vitamin C and D. They’re not the ‘healthiest’ in terms of calories, carbs and sugars, but they’re cute and convenient. Here we have some dried fruit to add to the bunch! These Natural Delights Medjool Dates came in a good snacking-size package, and can be used multiple ways. I personally am not a huge fan of them plain, but am contemplating ways to make fig-newton style cookies with them. I love a good granola or protein bar. That is a fact. I’ve marked down my favorites (and ordered them in bulk) and also noted all the bad ones: too soggy, too hard, bad flavors, etc. This GNUFoods Fiber Love Bar, luckily, gets to join my thumbs up list. While it is a bit softer than I would prefer, I love oatmeal raisin cookies and cinnamon/fall spices, and so I approve the flavor. It’s really high in fiber too, so it’s great if you’re trying to get your daily dosage up. And finally, we have this set of assorted tea bags! These Davidson’s Assorted Teas came in flavors such as Sun, Moon & Stars (jasmine scented tea, oolong, and light green tea), Tropical Green (green tea with tropical fruity flavors), and Red, Green & White (combination of rooibos, fresh green tea and white tea). I can’t wait to try them out with a dab of honey. Here’s the whole set! I was really happy with the variety, size and quality of all these products. Best of all, I can actually use them and don’t need to pawn a few off! After this box, I definitely recommend the KlutchClub Women’s Box. If you’re not interested in the KlutchClub Women’s Box, Check out the October Mens Box here or the October Mom Box here.